The Hollywood Stones return to Big Rock on Halloween Weekend Eve! Door begins at 8 pm. Seating is first come, first served. Inside seating is reserved for diners only ($20 minimum per seat please, and thank you for helping us support our live music program). Show will start at 9 pm. 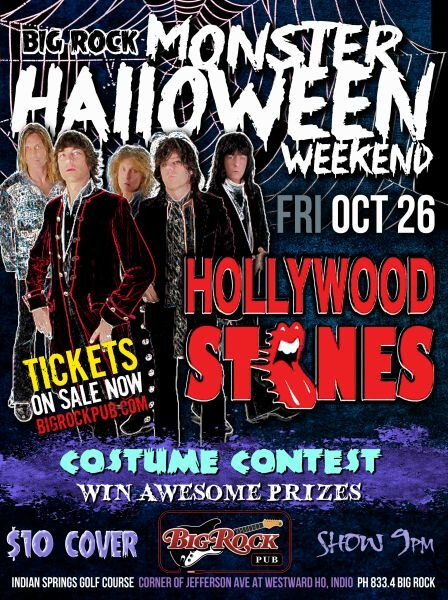 The Hollywood Stones return to Big Rock on Halloween Weekend Eve! Door begins at 8 pm. Seating is first come, first served. Inside seating is reserved for diners only ($20 minimum per seat please, and thank you for helping us support our live music program). Show will start at approximately 9 pm. Come dressed in your Halloween finest - there will be prizes for best costume! And be prepared to dance and sing all night - it'll be a gas gas gas. "You guys were fantastic! A great performance." "Remember The Rolling Stones when they were the punks of their day." "I love great cover bands, and what you guys do is cool…"
"America's best, and most popular Rolling Stones tribute band." "The premier Rolling Stones Tribute Band. They really have the devil by the tail"
"...Bloody time machine, just like The Stones...Let's Jam."